Deep South meets Singapore in this dish I cooked for Anna in her kitchen the other day when I was still too depressed to use mine in the middle of a construction site. I’m sure soft shell crabs are a treat outside the Southern States too – Louisiana and Mississippi especially, but that’s where I had the first taste of them so for me they’re always a part of fond memories from the coast of the Gulf of Mexico. Even though I’ve always enjoyed these Asian crab dishes a lot, I’ve also found it a bit onerous to separate the crab meat from the crushed shells and claws while dining. I had had my first spicy crabs way before Anna introduced me to the world of soft shells. The soft shell crabs I ate with her in Mississippi were deep fried in batter, and didn’t have much resemblance left to normal crabs taste or texturewise. I definitely didn’t hate them tough, but rather fancied the idea of chomping down whole crabs with shells, legs, claws and all. Anyhow, since soft shell crabs can be eaten whole without any leftovers, I thought they’d make perfect spicy crabs. A couple of months ago I was strolling though the isles of an Asian grocery store in Sydney, and saw a rack of Singaporean chili and black pepper crab spice mixes. I bought one pack of Seah’s Black Pepper Crab Spices and brought it back to Finland with me. Unfortunately soft shell crabs are really difficult to come by in Finland, so I had to wait almost three months until I found a new batch of them in one of the Asian stores I frequent in Helsinki. I finally had everything I needed for my Black Pepper Soft Shell Crabs experiment, and even Anna happened to be visiting from New York, so I knew my time had come. 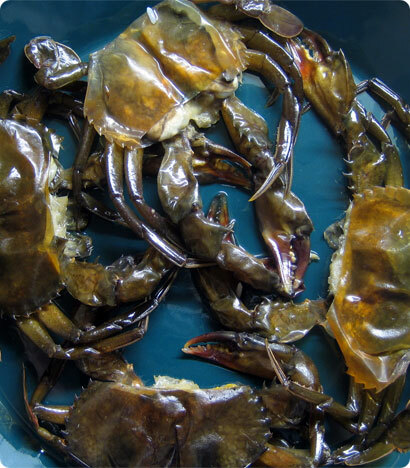 Clean the soft shell crabs by removing the mouth and eyes with scissors, lift the shell from both sides and remove the gills, and cut away the apron (tail). Steam the crabs in a bamboo steamer for 5-10 minutes until cooked and the shells have turned red(dish). Discard extra juices. Heat the oil in a wok and add the spice mix. Stir for a minute or two until fragrant, but be careful not to burn the spices. Lower the temperature and add the crabs and mix and turn carefully for a little while until evenly coated with pepper and the crabs are warm again. Serve immediately on a bed of rice. Ooohhh, yummy … wipe drool. The first time I ate soft shell crabs was in a Japanese restaurant in Singapore. It was so good I was an immediate fan. Yours looks really delish! If you ever get to Baltimore, go to Bertha’s (a local legend) and order a stack of Maryland Blue’s, either soft shell or the crab cakes. :) I prefer the crab cakes as there’s something about eating a critter whole that sorta squicks me. Kiitos viel? crabeista – en ollenkaan tajunnut ett? niitten pehme?kuorisuus on niin harvinainen olotila – ja aivan erityisesti jo legendaksi muodostuneesta sushifestista… Me paistettiin ne j?m?tonnikalapihvit eilen parillapannulla portugalilaiseen tapaan keitinperunoitten seuraksi ja ne oli yummyja, mutta kerro milloin voin ostaa sulle uuden pihvin sashimiksi? BTW, tied?tk? saako Suomessa myyd? lampaan tai vasikan aivoja? L?ysin tosi herkullisen aivoreseptin jota tekisi mielett?m?sti mieli kokeilla. Ja jos haluat h?r?nh?nt?muhennosta, tuu k?ym? ?n to-iltana. 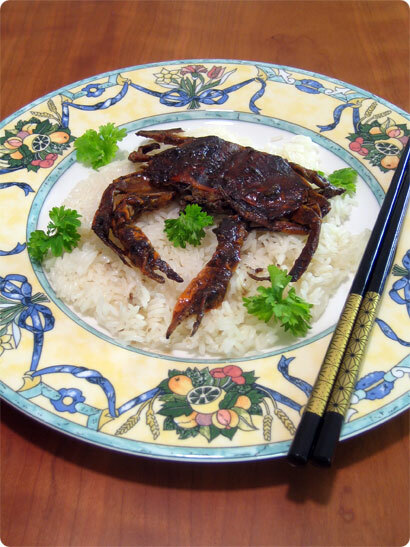 Hmmm, HK spicy crabs … without seeing the picture it is hard for me to tell. Were the chillies dried or fresh chillies? And re stalker .. shhhh, mebbe if we pretend he does not exist, he will go away. This is truly exotic! Never heard of soft shell crabs before. I.e. perhaps the crab was sitting on a pile of hot “crumbs” instead of whole chillies, as I remember eating those crumbs even after the crab meat was finished. In any case, the bed the crab was sitting on was dry. Cripes! I am not familiar with that dish – would be except for the addition of the coconut flakes. I’ve had another crab dish which is with ground buttery oats fried with Sichuan dried chilli flakes. Oh, heads up … I cannot post it on my blog until May/June but I am tasting 4 different crab dishes this coming Thursday, all with a modern Indochina twist. And I might be able to get one of the recipes for my blog. So fingers crossed. Maybe I can ask the chef is he know something about your crab dish in Hong Kong. Thanks MM, I’ll be waiting :) I don’t remember any coconut flakes in the dish, but your description sounds pretty close… Does that particular dish have a specific name? Mean ole marketing guy was with us during the tasting and would not let the chef give me any recipes! I hate marketing people … so speaketh the ex-marketing person. OK, the butter oats crab I had today was not veyr spicey at all but the chef said you can crush dried Sichuan chillies and add to the mix to give it the spice. Butter oats is usually just oats fried in butter, he said. I noticed he added some crushed fried basil to the oats. Gave it a nice Indochinese spiciness. Sorry, I wish I was more help.